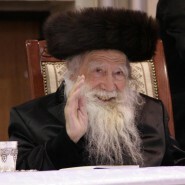 By the end of the Shoah, the 23-year-old Erloier Rebbe, who passed away this month, was left nearly alone in the world. As one of the only remaining direct descendants of the Chatam Sofer, the Rebbe dedicated himself for the 70 years following the War to rebuilding his great-grandfather’s tradition whose teachers and followers had been nearly entirely wiped out by Hitler. In post-War Hungary and then Israel, fulfilling that mission required tremendous determination and self-sacrifice. In Hungary, following the War, the Rebbe had 24 students, and only 8 beds, so the students slept in 3 eight-hour shifts around the clock. When the Rebbe arrive in Israel, his family was allocated a 2-room apartment for refugees, and the Rebbe set aside one of the rooms of his already crowded apartment to serve as a yeshiva for his first 7 students. Every week he, Rebbetzin Miriam, and his 5 children (they later had 2 more sons) divided their government food rations– a quarter loaf of bread and 7 eggs– with those same yeshiva students. By the time he died, the Rebbe left behind thousands of Chassidim and students. I have heard quite a few stories about rebuilding after the Shoah, the awe-inspiring stories of the Erloier Rebbe, the Klausenberger Rebbe, the Belzer Chassidim, and Rabbi Aharon Kotler zt”l to name a few. I search for stories like this. I find them so inspirational. To hear about Jewish visionaries who lived through the Holocaust and, with unbending clarity and iron-will determination, rebuilt empires from nothing. Rebuilt a thriving Jewish world from a graveyard. And I also think about the Jewish mothers who enabled and enable this rebuilding of the Jewish people. I think about the self-sacrifice required to create each and every Jewish child. The years of pregnancies and back pain and morning sickness and varicose veins and the pain of labor. The years and sometimes decades of caring for children, which is sometimes wonderful, and sometimes most definitely not. Reading about the Erloier Rebbe and other great rabbis and leaders like him, I wish that I had even a fraction of that same unbending clarity and iron-will determination. I wish I could see past the small picture, my kids, to the big picture–that with these kids I am helping to rebuild the Jewish world. I guess that’s why they are rebbes and great rabbis and I’m just a JewishMOM. But, truth is, there’s nothing “just” about being a JewishMOM. If it wasn’t for you and me and all of us, the Jewish people would cease to exist. We don’t have to DO anything different than what we’re already doing. All we need to do is REMEMBER not just the what. But also the why. Chana Jenny – You have much more than just a fraction of that same clarity and determination. This very site was birthed and now sustained with great inspired purpose and effort. my own parents married in the middle of WWII in occupied Europe with just a Minyan, not knowing what the future would bring.They later escaped to Switzerland where we were born – after the war they returned to Europe, from there they moved to the US & finally Israel where we are all settled today – with Hashem’s Help they raised a beautiful family – all descendants Yirei Shamayim BH! Am so inspired. My story similar to yours. May such descendants of war torn Europe who continue in their Emunah continue to flourish.